Some of OC's best ice cream made daily by old-fashioned machines. : Started in Ohio in 1936, Strickland’s has just one location in California, at this Irvine shop across from the main UCI campus. What makes Strickland’s different is the creamy cold stuff is made each morning in their reverse-engineering stainless steel machines. The ice cream turns out more like soft serve, yet it has a super flavorful and creamy texture unlike any other ice cream dessert. Strickland’s only has four flavors each day, including chocolate and vanilla. The two other flavors, which change each day, are more decadent like mint chip, black raspberry, Snickers and butter pecan. 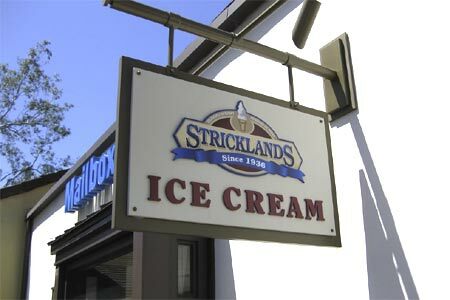 Strickland’s also offers sundaes, floats, shakes and take-home pints and quarts.